Hey everyone, hope everyone has been doing well. 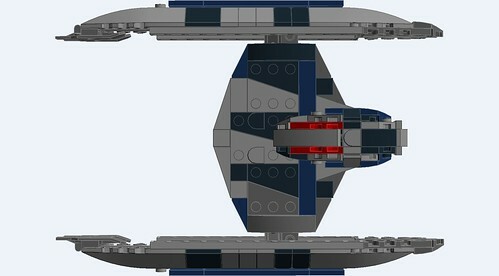 I've been busy working away at expanding my minifig scale MOC collection (Still only digitally atm). And thought I'd bring you something that I haven't really seen around anywhere. 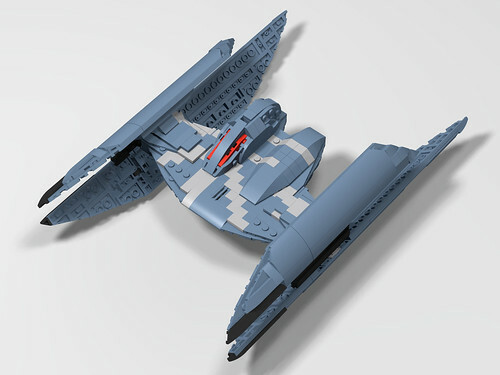 A minifig scale Hyena-class Bomber. This one was pretty tricky, but I think it came together rather well in the end. 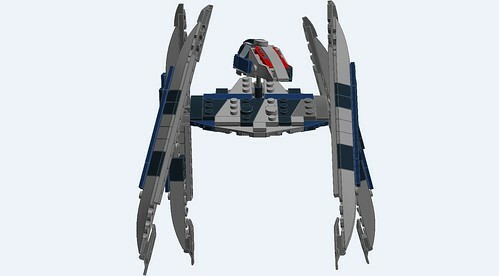 The official LEGO Hyena bomber was alright, but left a lot to be desired. 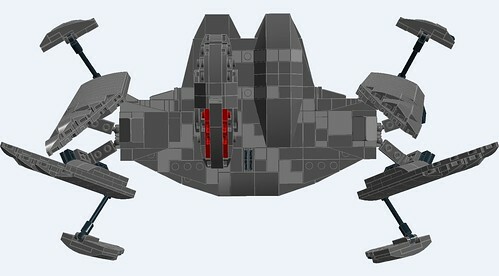 The overall shaping of the ship was kind of off and the walking mode looked nothing like the source material. 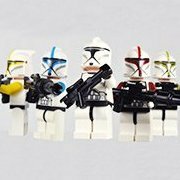 My goal was to get mine as close as I could and keep it in line with my other minifig scale builds. This was a little harder than I had anticipated, and I had to make one sacrifice right off the bat. There was no way that I could get the legs to physically retract the way they do on the actual ship, even more so at this scale. 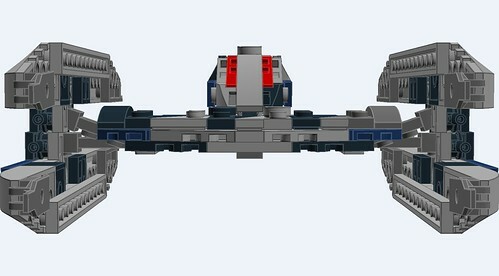 So unfortunately there is a small bit of "parts-forming" required between modes, but I made it as little as possible. 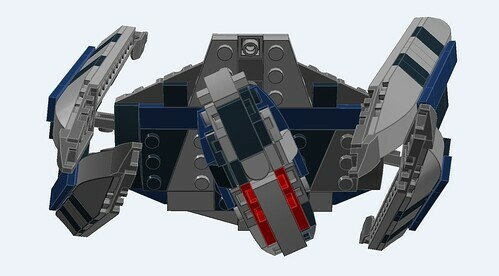 I was able to get the wing mounts to extend out of the main body to allow upper leg movement though. 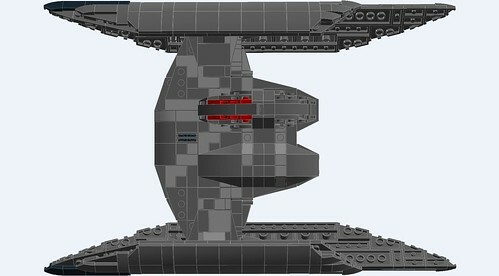 The other thing that always made the model look wrong was using the head build method established by LEGO. While the stickers used to make up the "face" look nice, the overall head shape is left extremely flat. It took a week or so of playing with parts, but I was finally able to come up with a brick-built head design I was happy with. 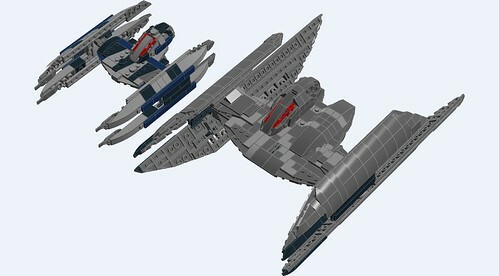 While it may not be perfect, for the most part has the general shaping of the actual Hyena bomber. 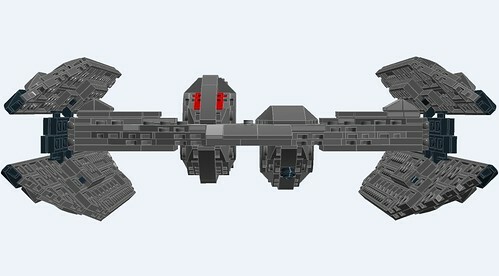 I then utilized variations of the technique to build the other head-like shapes on the ship, including the targeting head below. I've also included a couple photos with some of my other MOCs for size comparison. 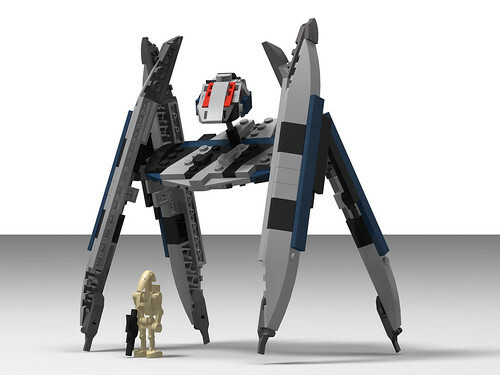 Prior to working on the Hyena bomber, I had built a minifig scale Vulture droid, but was unhappy with the stock LEGO style head. However after figuring out the head for the Hyena bomber it wasn't too hard to down-scale to get a suitable head for it too. 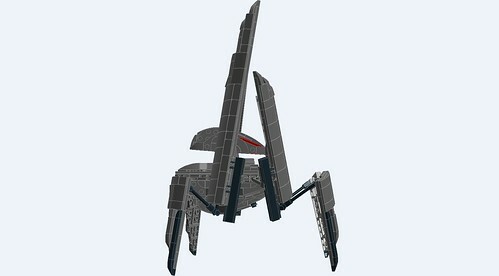 So since they are fairly similar I'm including the pictures of it here as well. 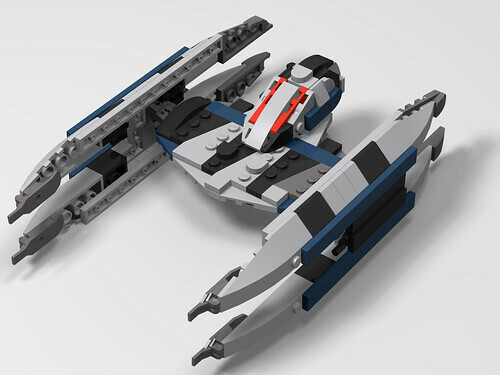 Both ships were designed to use The Clone Wars colour schemes, although it could be debated that they Hyena should be sand blue rather than DBG, but given that practically none of the pieces come in that colour, there wasn't much choice. There are scenes from the show where it does look more grey that blue anyways. As always, hope you enjoy! I'll be back soon with my minifig scale ATT and DDT. 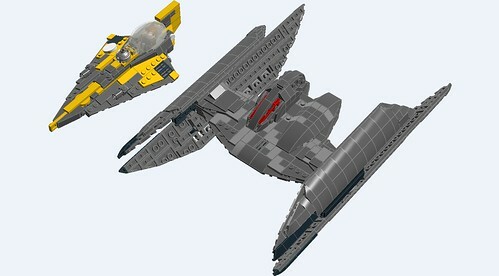 Sweet, the wings on the Hyena Bomber are spot on! Wow, the head is done really well, and I like the wings too! 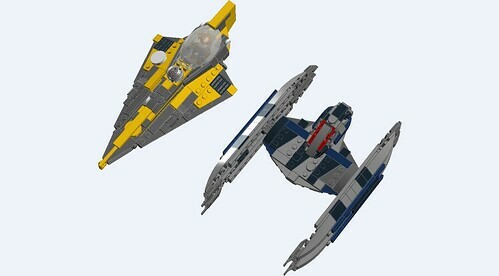 THe Y wing and jedi starfighter also look really nice. Did you design them? Would love to see some pics of them! Thanks! 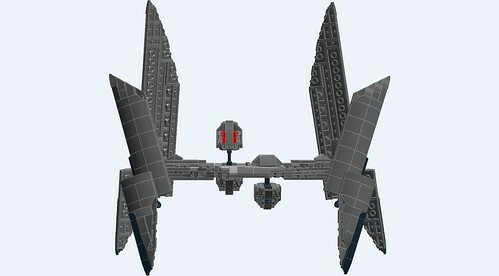 You can find more pics/info on my Y-Wing an Delta-7B on this forum, see here and here. 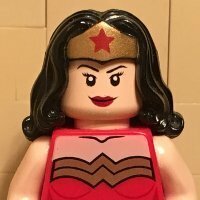 They're gorgeous builds, perhaps the best I've seen of either. 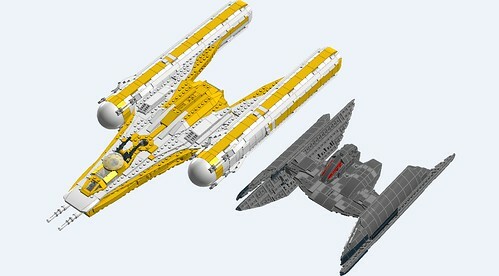 The hyena bomber is exceptional enough but the vulture is icing on the cake. The heads, the added texture of their build adds so much to the overall look in an overwhelmingly postive direction. 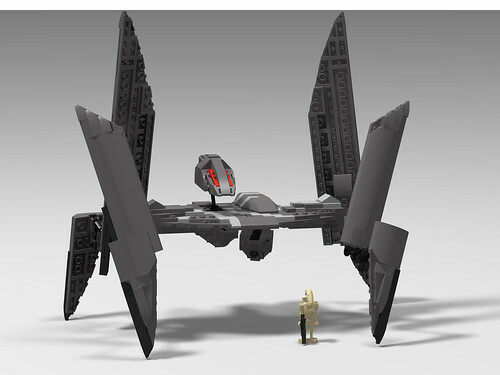 Lego take notes. My only criticism would be color. I understand sand blue is limited in part variety however I think the Heyena looks off without any blue. It's a nitpick. 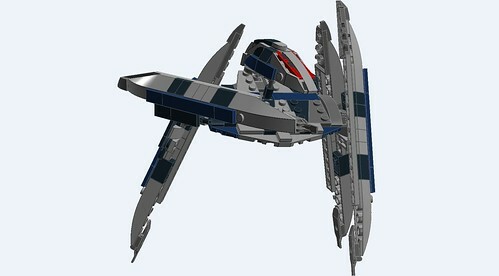 I don't want to take away anything from your build as the design is impeccable. Its just the color. I recognize the Vulture you're pattern is based on with black and it looks fairly spot on. 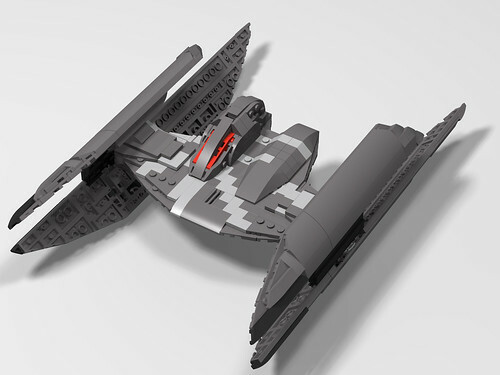 Fair enough, I think one aspect that would help would be adding the lighter design part on the wings, but it wasn't something I could easily do with bricks so I omitted it. The photo that I mentioned that showed them looking very grey was this one. But I also did a quick colour swap to sand blue. I admit, it does bring a little more life to the bomber.